- The other day I gave my kids chicken noodle soup because C was begging me to buy a soup in the can. I threw some frozen corn in to pretend effort was involved. A was like "Oh my gosh, who is the chef of this soup?" C responded " Campbells." No words kids, no words. - Manners mean a whole whole bunch to me and I'm trying to instill it in my kiddos. Grace is glory, friends! - This winter weather has me definitely feeling those winter blues--- bleh! Snow days help though! - Not going to lie. I love a good snow day! Those slower days with the kiddos and family time are sometimes just what we need. - I almost never do this except in the summer or on vacay LOL but I totally had wine on a Tuesday night. I blame the snow day and the feeling of downtime with only us... the fantastic four. Ha! - I freeze when I have a difficult conversation or even a confrontation..... which is almost never. I get shaken and very upset. After I rehash it in my head and then think of 10 ways I could have said things better. I need to get out of certain head- spaces when people are having real problems out there. - I am waiting for a warmer day before I fill my gas or wash my car. - A playing cards with us is the funniest thing. She drops the cards with thought and an exclamation like "Boom" or "Take that." I don't know if to be proud or worried. - I want to do yoga every week but because of trying to get those damn steps on my fitbit, it's the first thing to fall by the way side if I get 4 days of exercise in instead of my 5-6. - I have to weigh myself everyday to hold myself accountable when I'm watching what I eat. - I wasn't a Colton fan so I thought this would be the season I skipped. Yeah that didn't happen. I no longer watch it on a Monday night though. Instead I keep it on in the background while I'm working. That's progress no? Here's to Wednesday, lovelies! May it be wonderful! Too funny, I’m waiting for a nicer day to wash my car too. Love the confession about the soup and totally still love snow days. I soooo relate with the difficult converstaion thing. I alwats think of 10 ways I could have said things better. It really only bothers me if its people I genuinely dont want to have difficult convos with i.e. those closest to me. In work/court settings I can do and say whatever (within reason) with no regrets though. I weigh myself everyday too. I cant help it. I rally try not to weigh myself every day! But sometimes I do. The small fluctuations are kind of weird! I think we'll have another snow day this week. We're expecting a lot of snow this time! I have issues with difficult conversations as well I can do just fine with strangers but those close to me naw. I also have a tendency to cry when frustrated which makes me even more embarrassed. I used to do the daily weigh and then it just got to be to much I threw out the scale and gauge things on how my jeans fit. I too have struggle with difficult conversations. It's hard but I'm working on it. A bad conversation stays too long with me and then I'm miserable for days. I cannot let someone have that much power over me anymore. Oh man, manners!! It's shocking how few manners people seem to have these days and it makes me crazy!! I swear the people who work in my office building are the rudest folks on the planet!! So rude. I love reading posts like this. Your kids crack me up. I will not wash my car until summer - HA! Why waste the money?!?! It is yucky every other day! 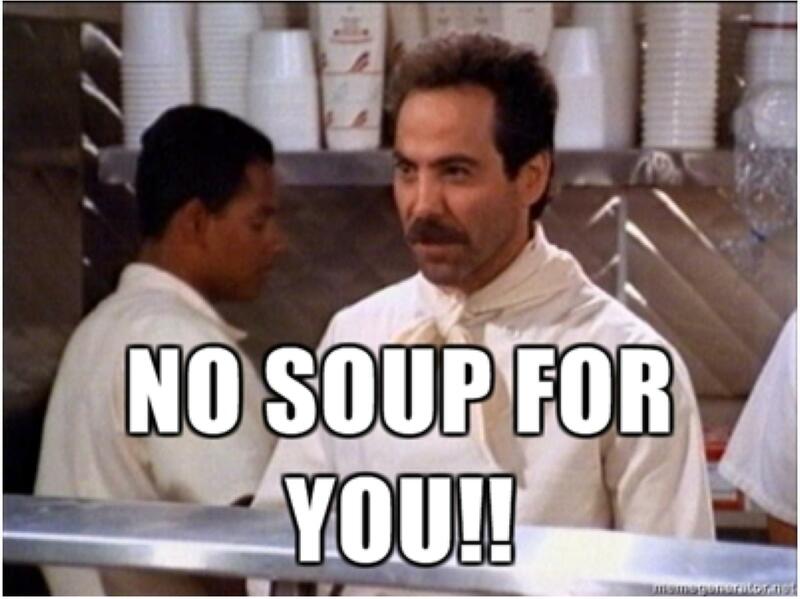 LOL at no soup for you! Sending some warmth and hugs your way to combat those winter blues. And I hear ya... I was not happy about Colton being the Bachelor but he has grown on me. Anything is better than Arie last year!